Borer insects are those insects that bore, or borrow, into the wood of a tree. In fruit trees, this can be particularly devastating to the crop and to the life of the tree itself. Boring insects usually attack trees that are weakened due to a previous injury or disease, so it is important to keep your tree as healthy as possible in order to prevent these attacks. Borer insects are actually the larvae of many common beetles, flies and moths that lay their eggs on fruit trees, according to the University of Missouri. Once hatched, these larvae burrow their way under the bark, when they eventually tunnel into the sap or heart wood of the tree. Borer insects actually consume the wood of the tree as nourishment. They eat the bark, sapwood and even the small twigs on the ends of the branches. This can affect flowering and fruit development. As the consume the wood, the insects excrete a powdery mass that fills the tunnel behind them. Fruit trees affected by borer insects often have black, cracked areas of bark, which signify dead wood. Sometimes the bark looks wet, or oozes sap. Wood shavings or cuttings on the bark may signify burrowing larvae, or piles of frass, which is the powdery waste that the larvae excrete. Some borer insects leave obvious holes in the wood, such as in the case of the shothole borer (Scolytus rugulosus). The peach tree borer is the most damaging insect to stone fruit trees, according to Colorado State University. It is the larvae of a moth called Synanthedon exitiosa. 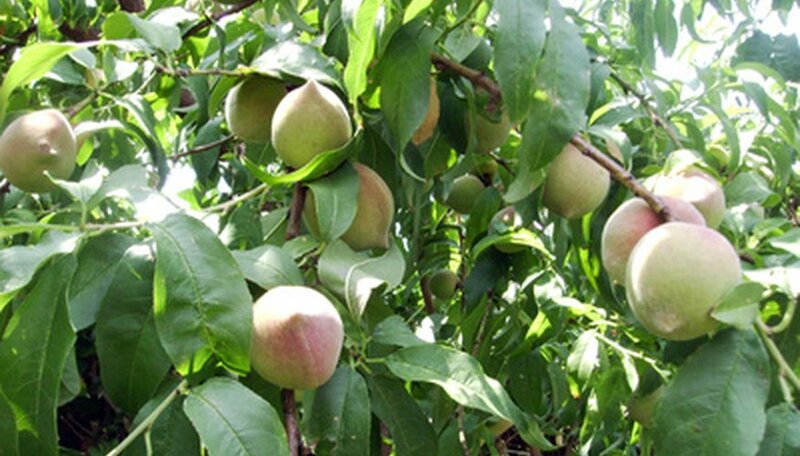 Affected fruit trees include peach, cherry, apple and plum trees. Peach tree borers attack the tree at or below the soil line, damaging the roots and causing an overall decline in the tree. Young trees may die if the infestation is severe enough. Other borer insects include the roundheaded apple borer (Saperda candida) and the flatheaded apple tree borer (Chrysobothris femorata). A systematic application of insecticides must be followed to successfully control borer insects on fruit trees, according to the University of Missouri. The insecticide must be applied when the adult borers are laying the eggs in late spring, as it is very difficult to kill the larvae once they have burrowed beneath the protective covering of bark. You can protect the trunk of young trees by wrapping it with several layers of burlap, but this must be done before spring arrives. Once the trunk is wrapped, the adult insects will not be able to lay eggs in the bark.